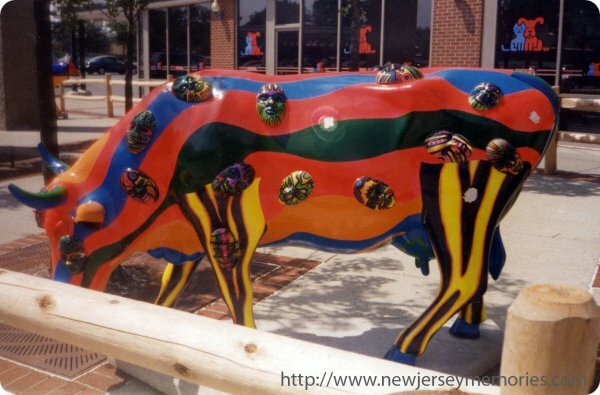 There has been an ongoing international art exhibit of fiberglass cows called CowParade. Among "major world cities" (according to Wikpedia) that have had fiberglass cows on display have been Paris, London, Sydney, Capetown, New York, Chicago . . . and West Orange, New Jersey! I had no idea that West Orange was a major world city but it is a town famous for its obsession with Thomas Edison. (Edison's laboratory and last home are still here and are fine places for the whole family to visit). In 2000 the cows visited West Orange for an extended period. I took several photos but have only managed to find these three photos of the thousands of photos I have in boxes and am trying to organize! The back of the photos indicates that I had them developed in October 2000. You can read more about CowParade here. You can find books on the CowParade (in different cities) on Amazon. For more Wordful Wednesday, click here. wow, those cows are pretty eye-catching. and you are right about Edison's lab and house being great places to visit. 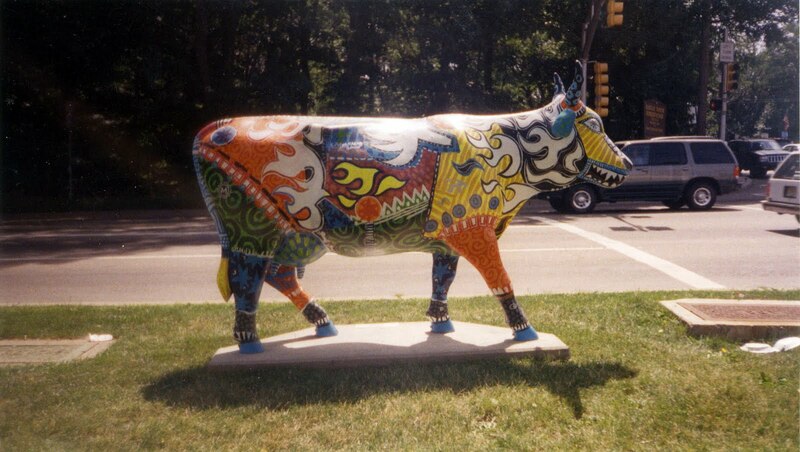 The Cow Parade was quite popular here in Texas. Perhaps it started here. Love the cows! So colorful and fun! I love these. I have seen little ones in the store like these. They are so cute. Funny. We have a similar thing here only they are keys. Sometimes they get stolen and relocated. Happy new year! I love how colorful they are! I've been so Edison's place many times and always find it fascinating. We always seemed to take field trips there when I was in grade school. It's been all over the world and is still continuing in some parts of the world. I actually really missed them when they were removed. They were there for months. As far as I know none of the cows were taken. Perhaps they were too heavy?